I often meet up with Paul Darby ex Wiltshire Wildlife Trust for a pint and a bag of twiglets and inevitably our conversation turns to wildlife. Recently he brought along a couple of his old insect books. In one, entitled Beetles of Britain and Europe – a rather slim Longman Nature Guide dating from 1986, I was intrigued by both the changes in taxonomy and by some of the common names. 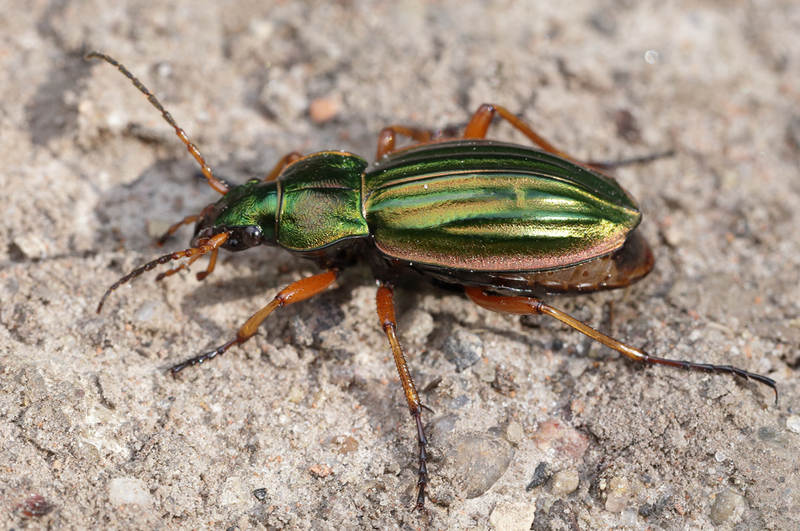 Many like the common name for the metallic green-gold ground beetle The goldsmith Carabus auratus, and ‘devil’s coach-horse’ for the large black rove beetle Ocypus olens I’m familiar with but others like wool beetle, bladder beetle and and bacon beetle were new to me. The wool beetle I discovered refers to Lagria hirta a species of beetle in the family Tenebrionidae. Hirta comes from the Latin hirtus meaning rough hair or rough wool, a reference to the fuzzy or woolly-looking elytra (wing-cases). Reading on I find the bladder beetles (Malachidae) owe their name (apparently) to their peculiar fright or defence reaction of ‘sticking their bladder-like, orange-red tubes thickly covered with glands out from their stomach’. This is not something I’ve noticed previously when extracting Malachius bipustulatus from my sweep net but I’ll make a note of it should one suddenly expose itself to me in this way. The bacon beetle turns out to be another generic term, this time referring to the domestic and food pests in the family Dermestidae. A name perhaps not so commonly-used now we store our bacon in the fridge and perhaps why these days this family is more widely known as the carpet, larder or skin beetles. Almost as enlightening in view of the recent weather here in the UK, courtesy of the ‘Beast from the East’, was the discovery that the larvae of some soldier beetles (Cantharidae) ‘may be driven out of their hiding places in spring by melting snow, and then become ‘snow worms’ on top of the snow’. If you felt something wriggle when you got pelted by snowballs recently now you know why.